1. RM150 was used to buy cat food for Maslinda’s community cats. 2. 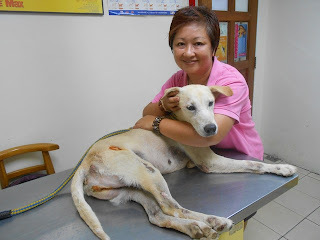 RM100 was used to pay part of Mdm Eng Geok Bee's bill for scrotum removal surgery, medication, vaccination and hospitalisation for a dog with an injured testicle. 3. 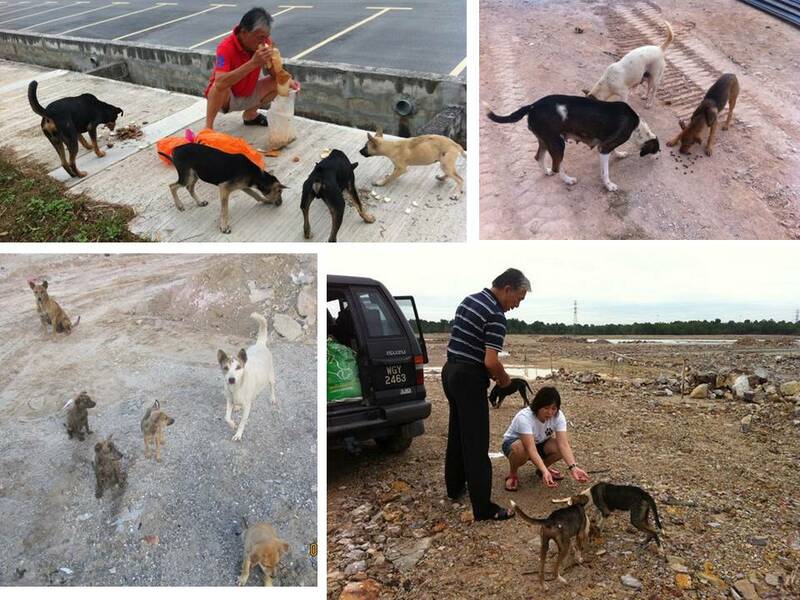 RM250 was used to buy dog food for Mr Low Hong Hang’s North Port dogs. The dedication and passion demonstrated by Dr Chan Kah Yein and her team is truly commendable and Ti-Ratana Meals on Wheels is happy to be part of this mission. 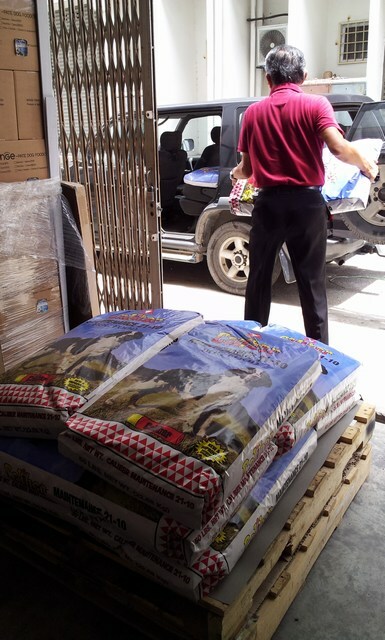 Thank you to our donors who enabled us to continue to contribute to AnimalCare. Siti Nurmaisara, 9 years old, suffers from cystic fibrosis which is a progressive, lifelong condition, in which the glands that produce mucus, sweat and intestinal secretions do not function properly. Thick mucus accumulates in the lungs, leading to breathing difficulty and infection. It also impairs digestion, which makes it difficult for Nurmaisara to get the necessary nutrients to grow. There is no cure for cystic fibrosis, but supportive treatments are available to help improve quality of life. 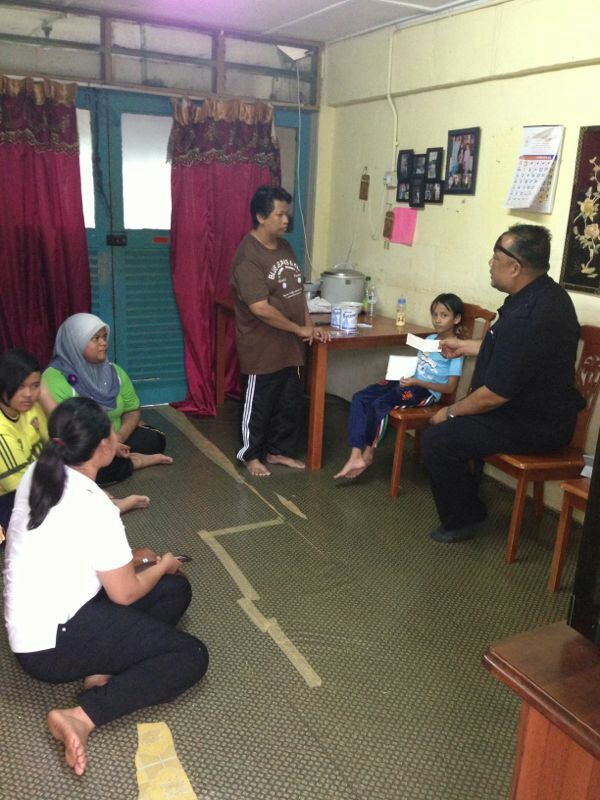 After our posting on Siti's plight, we received contributions from many donors, including Datin Seri Tiara Jacquelina. Datin Seri Tiara's representative visited Siti at her home in PPR Gombak Setia on 22nd April and delighted Siti with 2 tins of Peptamen Junior (they wanted to buy more but most pharmacies do not stock this special milk because of its short shelf life, and they only managed to buy 2 tins), a personalized get well soon card and a cheque donation. Hazlee, representative of Datin Seri Tiara presenting the milk, cheque and card to Siti & Fazilah. Siti holding the donation & personalized get well soon card from Datin Seri Tiara Jacquelina. click the youtube link to view Siti's Mother, Fazilah, sharing the complications of Siti's illness and expressing her appreciation to Datin Seri Tiara Jacquelina. We would like to thank all our generous donors who have come forward to support Siti and her mother, Fazilah. 13. Ti-ratana MOW regular donors which we have potion out their donation for this cause. Pictures and video courtesy of Datin Seri's representatives. MOW has been lending a helping hand to homeless animals by providing a monthly subsidy of RM500 to AnimalCare Society (www.myanimalcare.org) since January 2013. These funds are channeled directly into their Food and Medical Fund which feeds street animals and helps in their medical needs (neutering and treatment). For the month of January, MOW's subsidy was used to purchase dog food to support Madam Hooi's 200 community dogs in Kajang. 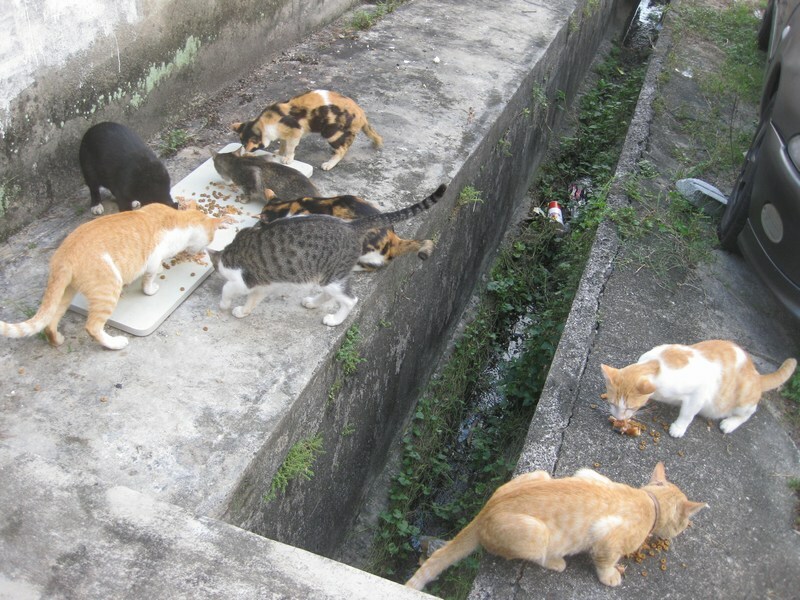 In February and March, the RM1,000 from MOW was used to sponsor dog and cat food for community cats and dogs at construction sites, as well as the spaying of 6 dogs/cats. 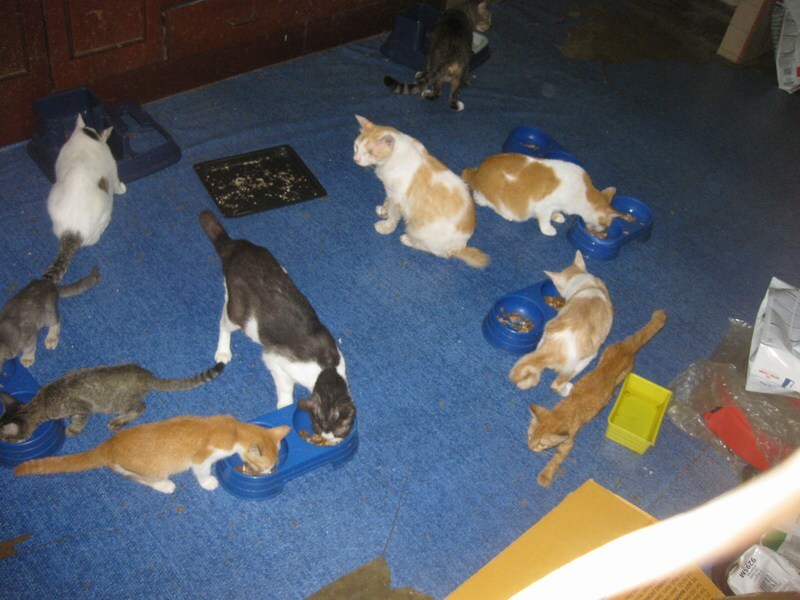 Below are pictures of some of the cats and dogs that benefitted from MOW's subsidy. KUDOS to Dr Chan Kah Yein and her volunteers for their compassion in caring for these helpless street animals. And of course, THANK YOU to MOW's donors who contributed to this program. 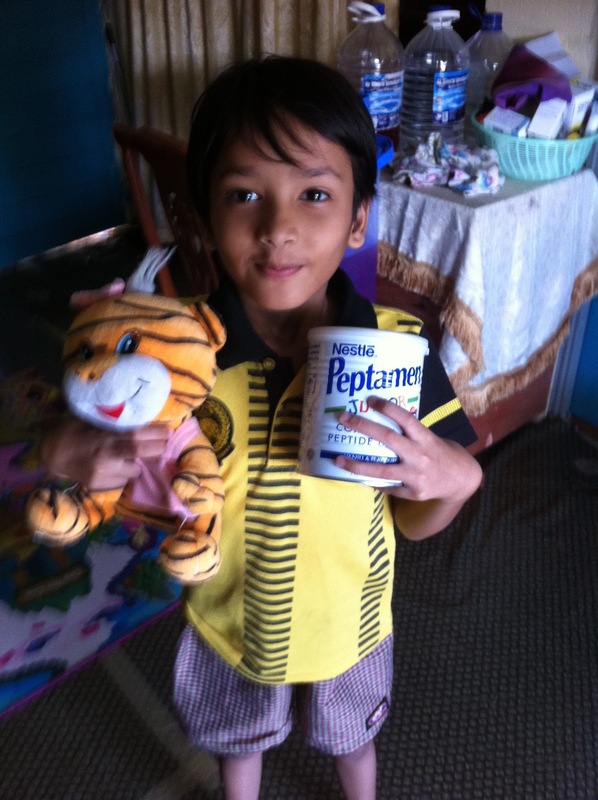 It has been a week since we posted the blog about Siti Nurmaisara, one of our MOW Food Bank family's child with cyctic fibrosis. Many things have taken place during this one week, but the good news is that Siti was discharged last Thurs, 11 Apr, and is finally home after more than 2 weeks in the hospital. Actually she was discharged on Wed evening, but because of the heavy downpour and flash floods in downtown KL, the mother was not able to get a taxi. Fortunately, there was an empty bed in the Paeds ward, and the nurse kindly allowed them to stay another night. I gave them a ride home on Thurs morning as I had some personal matter to attend to at the hospital on that day. We stopped by a petrol station on the way to Siti's house in Gombak, to get muffins, buns and soya bean milk as they have not had their breakfast. In the past week, many good samaritans came forward offering their support for Siti in various ways. 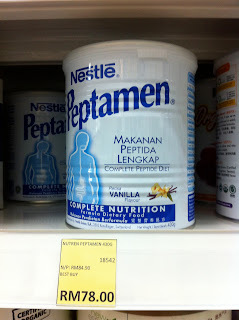 In particular, Dr Teresa and Dr Patrick who offered to contact Nestle, the supplier of Peptamen Junior, the milk which Siti needs to consume for her sustenance, to put on weight and grow, to build immunity and less susceptible to infection, be well enough to attend school and allow her to lead as normal a childhood, as a child with cystic fibrosis can. 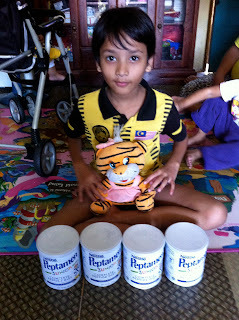 Nestle has kindly donated 4 tins of Peptamen Junior, which were delivered to Siti at the PPR flat on Friday (12 Apr) .... Siti was sooooo HAPPY as you can see from the pictures. We have also received cash contributions from the following kind and generous donors. The amount collected will be used to buy the milk, which is Siti's staple food, for the next few months. 12. Ti-ratana MOW regular donors which we have potion out their donation for this cause. On behalf of Siti Nurmaisara, we would like to say a BIG THANK YOU to Dr Teresa, Dr Patrick, Nestle and all the donors who have so quickly come forward to help in response to Siti's plight. Siti's family is grateful for your care and support. Since our post on the "MOW Celebrate - Christmas event with Orang Asli Pulau Indah", where we requested for support to set up a mini library in their community hall, we have received donations in the form of cupboards and floor mats, from a donor who wishes to remain anonymous, new books from Scholastic and pre-loved books from various donors. Thank you to all who have contributed! This is the first library in the community, and the Orang Asli do no have experience in the set-up, maintenance and running of a library. We would like the mini library to truly serve the community for many years. Thus we are calling for volunteers with an affinity for books and children to help manage this mini library and conduct quarterly/monthly (or more frequently if time permits) activities for the children in the community. 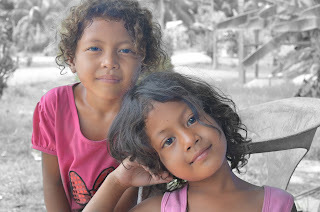 The Tok Batin expects between 40-50 children to use the library regularly. Please note that Pulau Indah is in Port Klang. This is a peaceful scene of the community, and the community hall where the library will be housed. Activities for the children can take place in or outside the hall. We still need more books for the library - both English and Malay books. The books should be suitable for pre-schoolers, primary school and lower secondary school children. They can be picture books, poster books, story books, workbooks, etc. We welcome pre-loved books. These children truly need your support. The library will be an avenue for them to learn more about the world outside their little community, encourage reading and learning, do better in schools, go to college and eventually make a better living for themselves. If you are interested to contribute to this good cause, either as a volunteer or donating books, please contact June at trccpenchala@gmail.com or call Kim at 012-3036019. One of our MOW Food Bank family recipent, Fazilah Mohd Yusof's youngest daughter has been hospitalised at the pediatric ward in KL GH for almost 10 days with a very bad lung infection. I visited Nurmaisara at the ward this afternoon. I brought chicken rice lunch for the whole family as her other two daughters were also at the hospital since its Saturday and they are not in school. According to Fazilah, Nurmaisara is recovering from the lung infection but is still getting antibiotic treatment intravenously through her chest. Fazilah herself looks exhausted from the long hours caring for her daughter, including sleeping at the hospital at night. She has two other school-going children whom she needs to care for, including cooking their meals. She does not have a regular paying job as she has to look after Nurmaisara, almost full-time. Her eldest daughter in Form 5 relieves the mother in the hospital on some nights, so that Fazilah is able to rest. The bus fare from her house to the hospital is RM2.50 one way. So between the two of them, bus fare works out to RM10-RM20 per day, depending on how many trips they make to the hospital. Although the transport cost puts additional stress on the RM400 she gets from the government social welfare in lieu of the youngest daughter's illness, this is just short term. The more pressing issue is the cost to care for Nurmaisara long term. Because of her impaired digestive system, most of what she consumes pass through without much being absorbed, which means she goes to the toilet about 10-12 times a day!!! 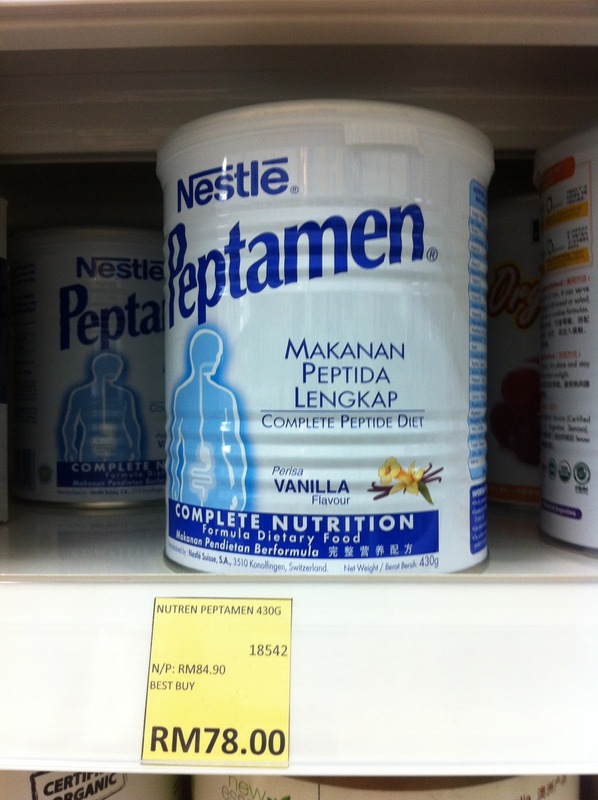 Doctor has prescribed a special milk called Peptamen Junior which helps in cases of malabsorption. She is currently being fed Peptamen in the hospital, 4 times a day with 4 scoops of milk powder in each serving. With this, Nurmaisara only goes to the toilet once a day. Fazilah is now worried about how she is going to sustain her daughter on Peptamen once she is discharged from the hospital. A quick check at a pharmacy in Damansara Uptown indicated that the small tin above cost RM78 (I only saw this at the pharmacy. Not sure if there is a Junior version). With her current consumption, it will be almost a tin a week, or about RM300 a month. If you or your friends know of anyone in Nestle from whom we can buy the milk at a discounted price, or if you would like to help Fazilah by donating Peptamen, regardless of how many tins, please contact June at trccpenchala@gmail.com or call Kim at 012-3036019. On behalf of Fazilah and Nurmaisara, we would like to say a BIG THANK YOU in advance for your generous support. MOW volunteers delivered groceries to the 14 urban poor families in our MOW Food Bank program on 24th Mar 2013. The groceries worth about RM100 per family comprise of rice, mihoon, instant noodles, Milo, flour, sardines, cream crackers, potatoes, eggs, bread, fresh vegetables and margarine/jam. These items will ensure the families especially those with children get the necessary nourishments. As with previous months, the MOW volunteers were happy to do the delivery and the families were grateful for the groceries. MOW Food Bank donors - SADHU SADHU SADHU for your continued support of these less fortunate families. Fourteen MOW Food Bank families in Sentul, Setapak, Jinjang and Gombak received their monthly groceries on 24th Feb 2013. The dedicated and passionate MOW volunteers spent their Sunday visiting and bringing groceries to these impoverished families. The joy and gratefulness expressed by the recipients bring great satisfaction to the volunteers, and it was certainly an activity worth spending their Sunday on. 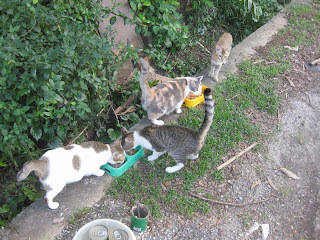 The new family included in Feb Food Bank called me on the 2nd day of Chinese New Year, pleading for help. The 32 year old mother of four lives in PPR Desa Rejang. The husband abandoned the family about 10 months ago. She is a road sweeper bringing home RM450 a month. Since the departure of her husband, her two older children, aged 11 and 13 years, have stopped going to school as she no longer can afford to send them to school. Although primary and secondary education in Malaysia is free, there are various fees to be paid during the beginning of the school year, as well as bus fares to/from home to school. Her two other children are 4 and 5 years old. A piece of good news to share ... one of the families in our Food Bank program, Rozana Dollah managed to get her 19 year old OKU daughter, Najiha, enrolled in the 6-months Economic Empowerment program in Rumah Amal Cheshire, Selayang. This is to enable her daughter to learn to be independent, especially when Rozana is no longer around to care for her. It is a live-in program, whereby Najiha stays at Cheshire from Monday to Friday. On Friday evening, her mother will take her home, and send her back to Cheshire on Sunday evening. 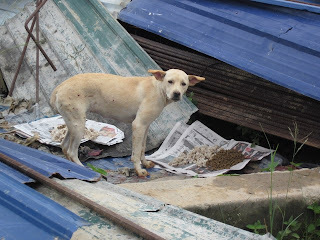 The fees for the boarding program is RM600 a month (reduced to RM300 from Feb onwards after Rozana appealed on compassionate grounds), while the transport to/from Cheshire in Selayang and Desa Rejang cost Rozana RM50 a week. She only makes RM700 a month as a school cleaner. Fortunately, we managed to find a donor who has committed to pay the fees from Jan to June 2013. When I told her the good news and reimbursed her for the RM600 Jan fees she has paid, she couldn't believe it. She kept asking me "Betul ke Puan? Banyak sangat la Puan. Terima kasih banyak-banyak Puan." Her voice was breaking and she was almost in tears ... I could feel her relief and gratefulness. At that moment, I felt soooo good as the bearer of the good news and the RM600 cash:) The RM50 a week or RM200 a month transport cost is also a big burden on Rozana, and we are still seeking a donor for this. 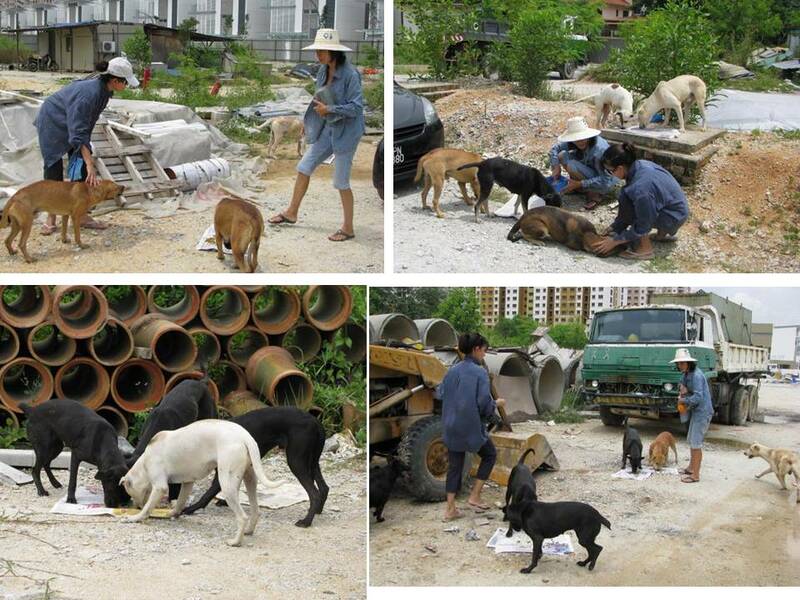 If you wish to help, please contact June at trccpenchala@gmail.com. It is experiences like this which makes the MOW volunteers go back month after month to help these families ... the feel-good factor knowing you have made a mother, a kid, a family ... happy, relief and grateful. Thank you to all MOW Food Bank volunteers and donors for showing that you care!